Through its Study Happy campaign, the Library encourages both undergraduate and postgraduate students to focus on wellbeing, connect with other students, take a break from studying, and get creative or learn a new skill. 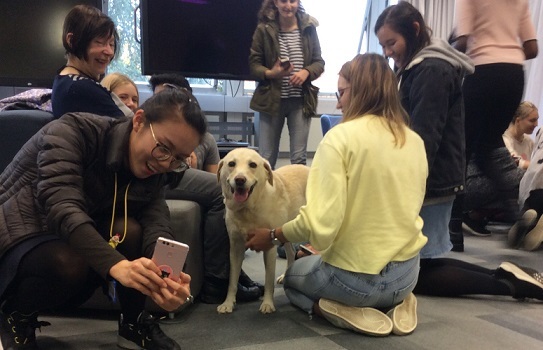 Regular events in the Library include mindfulness sessions, creative chillout sessions, language exchange workshops, and our ever-popular visits from the Pets As Therapy dogs! All events are free to attend, although while most are drop-in sessions, some of the sessions can get very busy and booking is required. Visit the Study Happy webpage for more details. Through the practice of meditation and "in-the-moment" techniques, mindfulness cultivates in us the ability to free ourselves from our habitual responses. The result is that we are increasingly able to think, feel and act with a new sense of clarity and purpose in both every day and major moments of life. Learn some practical mindfulness exercises to help you feel calm and in control. Library mindfulness sessions take place in Term 3 on Wednesday lunchtimes at 1pm, Weeks 1 to 7, in the Seminar Room (Library Floor 2). No booking necessary, open to all students at the University of Warwick. If would like to learn more about mindfulness practise, visit warwick.ac.uk/mindful-library. Sport and activity can help lift your mood and take away built up stresses. Warwick Sport run initiatives throughout the year to help make your time at Warwick a happy, productive and active one. They aim to show all students and staff how adding a little movement to your day can have a big impact. At Warwick, our Wellbeing Support Services offer a range of resources and services to help you navigate the challenges and opportunities of postgraduate study. Sign up for a Living Well at Warwick session and learn how to approach a variety of issues that can arise during your study, from procrastination and motivation, to managing change and homesickness. As part of this, there are a number of sessions tailored towards postgraduate students to support you during your studies. The University Counselling Service also runs a range of specialist workshops to help students understand and cope with specific issues. If you wish to discuss ways to improve your wellbeing in a 1:1 meeting, you can also book a Wellbeing Appointment with a Wellbeing Adviser, available throughout the academic year. In addition, Wellbeing Support Services also offer student support for practical advice and help on a range of issues, and sessions with mental health co-ordinators and counsellors for anyone experiencing emotional or psychological difficulties. More information regarding wellbeing and support services is available here.